This EML to Outlook PST Converter is capable to divide PST file into several parts. Users have to check 'PST Split' option to divide PST into manageable size. EML to Outlook converter enables the users to migrate selective emails or folders of EML files to Personal storage table. Moreover, this tool maintains folder hierarchy while converting EML files. The tool also generates an instant preview of email attachments before exporting the .eml file to PST. The tool generates an instant preview of email messages before converting EML file to PST. Users can view emails in different modes like Normal, Hex, Property, HTML, MIME Message Header view, RTF view, etc. Moreover, users can also change screen view mode from horizontal to vertical or vice-versa. The initial screen of EML to Outlook PST Converter provides Windows Explorer style interface. From the left pane user can select the folder containing multiple EML files and all of its emails and data will get auto loaded with item count. The EML to Outlook PST Converter gives you the ability to sort all the emails based on some specific criteria such as To, From, Subject, Sent Date, Received Date Fields and filter out the rest. Users can select the required emails and export EML to PST. At the time of making the conversion, this tool provides an option to split Outlook Data file by its size into multiple small parts. If the user checks the option ‘PST Split’ then resultant PST file will be divided into manageable small parts. EML to Outlook PST Converter supports all the email clients platforms that save data in EML format. These email clients includes Windows Live Mail, Eudora, Mozilla Thunderbird, Outlook Express, etc. While converting EML file to PST format, this tool creates Unicode type PST file by default. This helps in sorting a large number of emails as Unicode PST belongs to Outlook 2016, 2013, 2010, 20017. Moreover, it has the capacity to store up to 20 GB of data. This tool EML to PST Converter facilitates the users to save resultant PST file at any desired location. However, users can also create the New folder through the software as they browse for the location to store Outlook PST file. 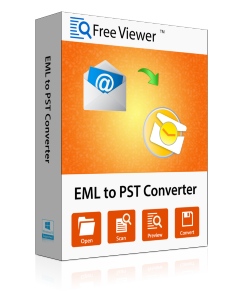 The EML to Outlook PST Converter tool comes pre-packaged with many features that will help you to make the whole conversion process easier and simpler. You will get each and every email in formatted and structured way. Ability to filter out the unnecessary emails and only export emails that you wish to retain. Easily Export EML to PST format which in effect help you to save time and efforts when doing the selective conversion. When making the conversion process you don't need to have installed Microsoft office installed which makes the software a complete standalone application. The application is fully equipped with features and minute details have been taken care of so that user can make the conversion easily. Window Live Mail to Outlook Converter is simple and comes with easy to use interface for readability and PST conversion. The application is Windows OS friendly that mean it can be installed on any version of the Windows OS. Help you to make batch conversion of your EML files into PST format. 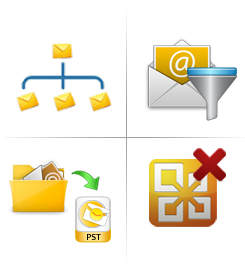 Demo version of EML to Outlook PST Converter Tool export only 10 Emails from each Folder. How can I export EML to PST by this tool? Does Microsoft outlook installation be mandatory to export EML to PST? No, Outlook installation is not required to move EML file to PST. This tool creates PST file independently. But, if the user wants to open PST file further then, you have to install Outlook and configure it properly. Are there any external dependencies? No, EML file to PST Converter is completely standalone and does not require any other application (e.g. Outlook Email Client) for the conversion process. Is the converter UNICODE compatible? When you will perform the process of EML to Outlook PST conversion the software will convert the emails in UNICODE FORMAT which is compliant with all the Outlook versions (2007, 2010 and 2013). Can I convert multiple EML files to PST format? Yes, of course, you can easily convert EML to PST in batch. At a time multiple EML files can be export to PST. Is there any file size limitation imposed on resultant PST file by the tool? "The software gives you the freedom to easily make the conversion from the .eml files to my Outlook email client. The EML to PST Converter is recommended for easier conversion and migration process to the newest Microsoft Offering." Great technical support team, take my words just chat with them and even if you haven't bought the product they still answer your query with the same zest. Very few are able to do this with such grace and also your EML to Outlook PST Exporter worked like a charm." The EML Converter for Mac software makes it easier to archive complete mailbox emails in Apple Mail application. It can create a single PST or MBOX file for complete email folders. It is compatible with Mac OS X 10.10 (Yosemite), Mac OS X 10.11 (El Capitan), Mac OS 10.12 (Sierra) and Mac OS 10.13 (High Sierra). The tool can work with both EML and EMLX file types. It can import a folder containing multiple .eml files and export it to EMLX/PST/MBOX format. Same goes for EMLX files, just add a folder containing multiple .emlx files and save it to EML/PST or MBOX format. There is no limitation on the size of the files that can be imported to the tool. There are no changes to data made of any kind during the migration. 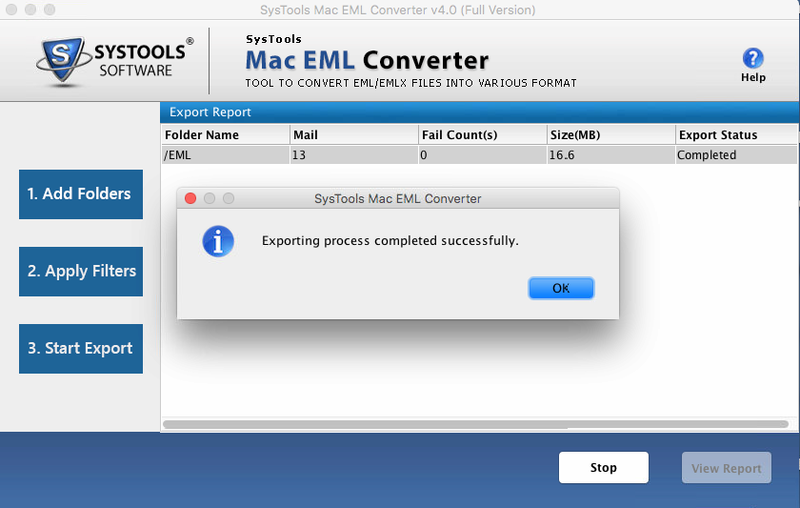 The EML Converter for Mac ensures 100% accurate results. Even the email formatting or header properties are kept intact. It is a safe tool that can be downloaded without any fear of malware or viruses affecting the system. Save individual message files in three different formats. Transfer Apple Mail to Outlook for Windows by migrating .eml files to PST format. Backup Mac Mail to MBOX by transferring multiple EML messages with attachment to a single .mbox file. There is an option to create a single PST or MBOX file for each EML/EMLX folder. The EML Converter for Mac software is designed with simple features that can be used even by a non-technical person. It is built with powerful algorithm that provides accurate results and can work in a business environment. It has all the features readily available with a click on a few buttons. When migrating EML to EMLX or vice-a-versa, the EML to PST Converter Mac makes it optional to retain folder structure. This is an additional facility that permits the user to opt out of keeping the data integrity to save time. This option is only available when moving EMLX to EML or vice-a-versa. Another feature when exporting EML or EMLX format or vice-a-versa is to give names to output files. When an EML/EMLX folder is imported into the tool, it can be extracted to multiple .eml or .emlx files. These files can have different names based on their subject, Received date or serial number for the email. 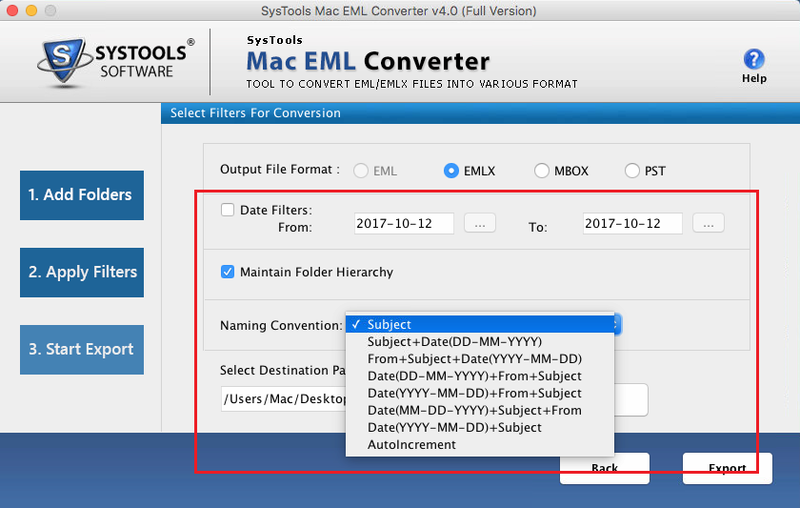 The Convert EML to EMLX Mac program provides an option to filter emails based on a date range. Just set a ‘to’ and ‘from’ date to simplify conversion based on the ‘Received Date’ of the message. This prevents any needless migration of data and saves overall time. The tool is a reliable and relevant software as it generates a complete export report after migration. This report contains details of email count, failure count with source and destination path. This is a CSV file that can be saved to the computer for future reference. 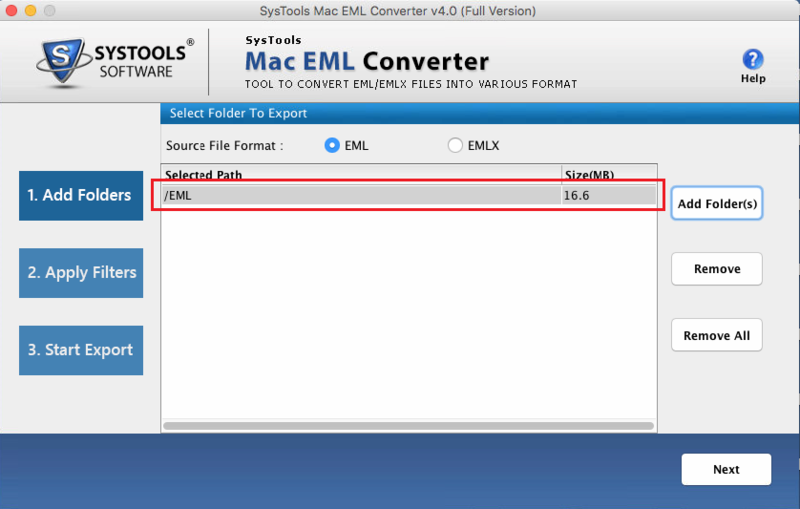 How Does the EML Converter for Mac Work? Does the EML Converter for Mac software require any specific prerequisites to work? Yes, the tool requires Apple Mail installation with Java development kit 1.8.0_101.This should be all to migrate EML to PST Mac. Can the utility work with corrupt EML files from an Apple Mail application? No, the conversion algorithm is only designed to work with healthy EML or EMLX files. Where are the EML files saved on my Mac OS? They are available as messages on Apple Mail application. Right-click on a message and select Save option. Then, go to the location where these files will be saved and set a name for the file and click Save. For multiple selections, go to an Apple Mail folder and select Ctrl+A key and drag the emails to the nearest folder. 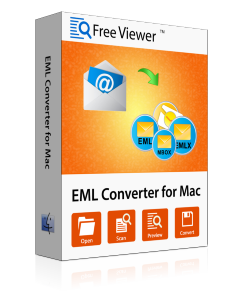 What are the benefits of using the Free version of the EML Converter for Mac? With the free version one gets migrate 25 items per folder. It is recommended to try the free tool before going for the full package. Can this Mac EML to MBOX, PST Converter tool be used for commercial purposes? Yes, any home or business user can use this tool. It is a simple yet professional tool to backup Apple Mail data to PST or MBOX format. What are the EMLX files and where are they located on my Mac computer? This is a message file type and it can be found in the “~user/Library/Mail/Mailboxes/(mailbox)/Messages/" folder or the "~user/Library/Mail/(account)/INBOX.mbox/Messages/" folder. I am a graphics designer and all my communication is in images and image attachments. It is very important to me that when I back up my Apple Mail that my client data remains unchanged. I used the EML Converter for Mac to secure the image quality while backing up mailbox data. Even the in-line images are email formatting were kept intact. This tool is highly effective software. It is very easy-to-use and comes packed with all the features to manage EML files. We were even able to transfer some important conversations to Outlook PST format. Our data center teams are quite happy to use this tool. It has made their task to migrate emails across platforms from Mac to Windows OS much easier. Our business deals with a lot of email communication that has accumulated over the years. We ask our employees and customers to backup Apple Mail regularly. They save messages as EML files that are difficult to manage. Now, the EML to PST Converter Mac has helped us manage this problem. All our client and customer data are saved in MBOX format. Thanx! My business is dealing with complete data accuracy for legal purposes. Our requirement for regular Apple Mail backup led us to this to this software. It is most professional tool available on the market. It comes with multiple features packed all in one software. The coding does not get affected even with more than 40 GB of EML files.